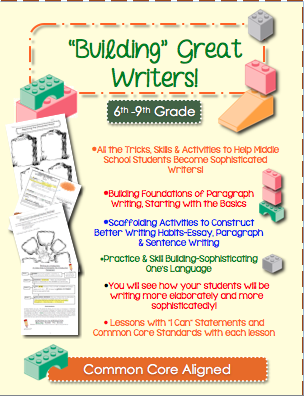 The Best of Teacher Entrepreneurs II: Language Arts Lesson - "'Building' Great Writers-Huge Writing Unit"
Language Arts Lesson - "'Building' Great Writers-Huge Writing Unit"
Language Arts Lesson - "'Building' Great Writers-Huge Writing Unit for Middle School"
***Super Bowl Weekend Sale*** 10% off all my products! Over the past 15 years of teaching, I have worked diligently and rigorously on planning a unit that covers and builds students’ skills in writing. In the past, my students have struggled writing an introduction, as well as a conclusion; in addition, they have a hard time lengthening their sentences to sound more fluid and refined. My colleagues have also asked me for some skill practice in writing for other disciplines, and sometimes they will borrow my dittoes to use in their classes. Therefore, I really created this unit for everyone and every discipline. *10 2-day lessons ( plus 4 mini-lessons) from the foundations of writing to the final assessment. 1. Starting with the Foundation-What do we know? 9. Assessment-Putting It All Together-Should Cell Phones Be Used in Schools? *This bundle is 63 Page PDF file, which also includes two Smart Board presentations, as well as 4 Word documents for edit. *All the lessons come with instructions, an "I Can" statement, and the Common Core Standards for each lesson. This is an amazing resource, and I use this for my entire 3-Week Writing Unit.